We are professional supplier of 5-Bromophthalide CAS 64169-34-2 that is an important intermediate for FG-4592. 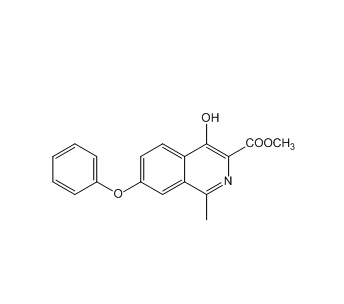 FG-4592 is a HIF α prolyl hydroxylase inhibitor that is approved for the treatment of anemia. 5-Bromophthalide CAS NO 64169-34-2 is white to pale yellow crystalline solid with the molecular formula of C8H5BrO2 and formula weight of 213.03. We have certain inventory. If you need 5-Bromophthalide 64169-34-2, please contact us. Usage: FG-4592 is an HIF α prolyl hydroxylase inhibitor in clinical development for the treatment of anemia. Looking for ideal Perfect Quality FG-4592 Intermediates CAS 1421312-34-6 Manufacturer & supplier ? We have a wide selection at great prices to help you get creative. All the CAS 1421312-34-6 Synthetic FG-4592 FG4592 are quality guaranteed. We are China Origin Factory of FG-4592 Intermediate 2 CAS 1421312-34-6. If you have any question, please feel free to contact us.